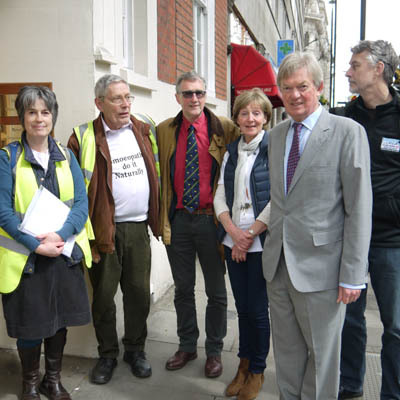 On Monday 16 April 2018, a group of pet owners, farmers and animal therapists, accompanied by David Tredinnick MP, Anna Webb the BBC radio London reporter, Jenny Seagrove and many members of the British Association of Homeopathic Veterinary Surgeons (BAHVS), marched on the Royal College of Veterinary Surgeons (RCVS) calling for a retraction of its November 2017 statement on the use of complementary and alternative medicine (CAM), which it says is an unprecedented attack on their clinical freedom and clients’ rights to choose. 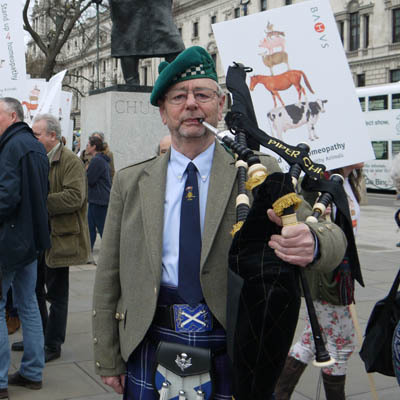 The march was a colourful and noisy event with some people dressed as animals accompanied by dogs and led by a bagpiper. On reaching the RCVS, a delegation went inside led by Chris Day, president of BAHVS, and including Ilse Pedler, junior vice president, Peter Gregory, Veterinary Dean to the Faculty of Homeopathy, David Tredinnick MP and Chris Gosling an organic dairy farmer to meet Stephen May, president of RCVS and Lizzie Lockett, CEO. Ian Holloway, director of communications was also present. The meeting was scheduled to last 30 minutes but actually lasted 1 hour 45 minutes. 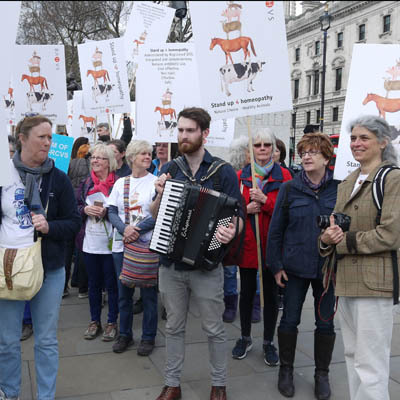 A frank exchange of views took place and the delegation presented the RCVS with over 100 testimonials from animal owners and evidence of the harassment that homeopathic vets have had to endure over the last few years. 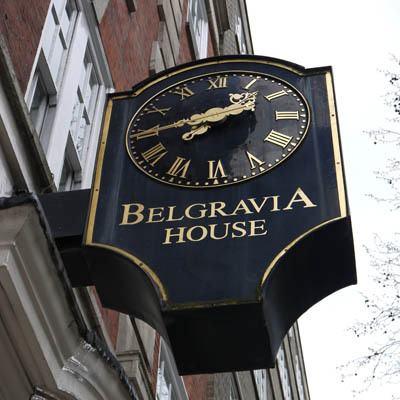 The statement was discussed at length including the effect that it was having on BAHVS members’ health and wellbeing and livelihoods where uncertainty remained over prescribing homeopathy as a first line treatment. It became apparent that there was a total lack of understanding of the principles of homeopathy on behalf of Stephen May and Lizzie Lockett and it was difficult at times to find common ground. They were invited to see practice with the homeopathic vets to widen their understanding. There was also discussion on types of evidence and it was emphasised that consultation should have occurred with the appropriate bodies on the existing evidence base before the statement was produced.